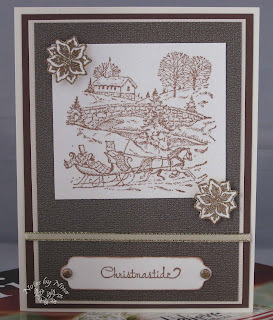 I love the almost vintage look about this card, I stamped it in Versafine Sepia then added glitter on edges of the whole image so that it sparkled as if a new skiff of snow had fallen on it. The pointsettas were embossed with Metallic Medley, I also embossed the tips of the brads to give them a sugar coated look. 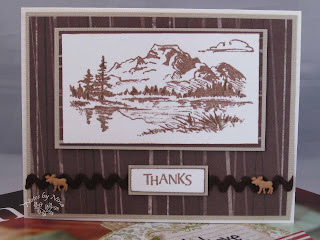 Supplies: Cream and brown cardstock, Stampin'Up! - Sleigh Bells Ring, misc pointsetta, Cornish Heritage Farms - Christmastide, Spellbinders - Double ended tags, misc ribbon. This is a Christmas card that I made for my son's music teacher, I loved the music notes and the glitter on the designer paper. Supplies: Cream and Blue cardstock, Bo Bunny's Glitter Series, Martha Stewart- Snowflake punch, Making Memories Snowflake Charm, Spellbinders Shapeabilities - Fancy Tags, misc silver brad. I made this card for a Baby's first Christmas for a little boy. Supplies: Cream and blue cardstock, Designer Paper - Bo Bunny, Sunshine Design - Mittens, Martha Stewart - Snowflake Punch, Recollections - Pearls. 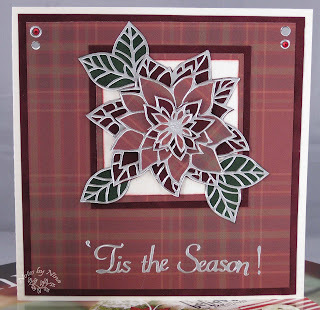 I saw these Dazzles on a PaperWishes Demo and wanted to give them a try, I used the Stackable Pointsetta on a burgundy suede and plaid designer paper. The suede designer papers are so touchable, almost like a thin velvet. I used a green suede designer paper for the leaves. Then finished it off with Christmas Greetings Dazzle to finish. The inside shows a dazzle just put on plaid designer paper. Supplies: Supplies: Cream cardstock, Designer paper burgundy and green suede - Hot off the press and Misc plaid, Hot off the Press Stackable Pointsetta and Christmas Greetings Dazzles, Recollections - Gems. I found this stamp hiding in my stash and wanted to see what I could make with it. After it was created I thought I might try my hand at entering it into a card contest at a local stamp store.. I won second place :). I am pretty happy with myself. Supplies: Cream and green cardstock, Designer papers: Kaisercraft - Winter Wonderland Silent Night, Inkadinkado – A Light for the Holidays, Cornish Heritage Farms - Wishing you Christmas Cheer,Martha Stewart – branch punch, Spellbinders Nestabilities – Labels Four, Kaisercraft- Pearls, atyouSpica – Glitter markers, Gelly Roll – Clear star. I thought this would be a cute card for our friends that have children, I had fun making it. 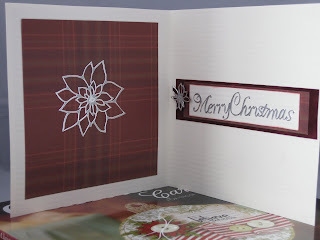 I used the Paper Shapers Snowflake Border Punch along the edge. 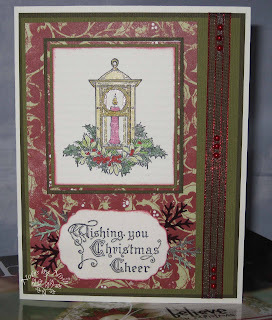 I used the Spellbinders Nestabilites Small Classic Inverted Scalloped Square. 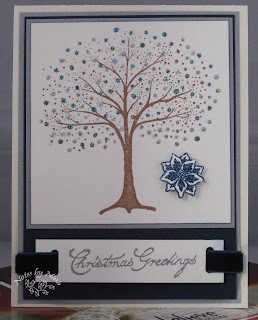 Supplies: Cream and blue cardstock, Close to my Heart – Snow Friends, Inkadinkado – Seasons Greetings ,White perfect puff, misc Let it snow ribbon, misc foam snowflake, brad and metallic snowflake, Midnights stars embossing powder. Gold and green, this is the third and last in this Christmas set. I could not find any green velvet ribbon for this card so I made the change to gold. Gold shimmer cardstock and a gold shimmery ribbon. 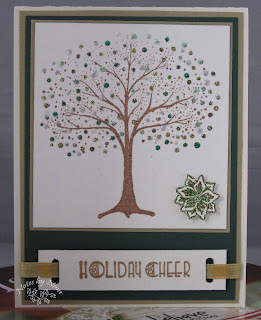 Supplies: Cream, gold and green cardstock, Penny Black - Fantasy, Cornish Heritage Farms- Vintage Christmas, misc pointsetta stamp, gold shimmery ribbon, Stickles, Ranger Antiquities Christmas Tree and Queens Gold embossing powder. Blue Christmas :). This is the blue version of the card I posted yesterday, I probably should have posted all three colours together but I like giving them thier own little spot-light time. 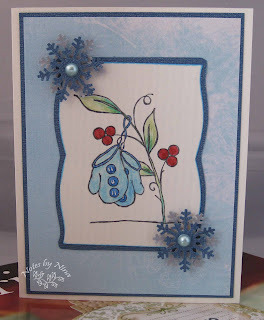 I did not realize the extent of my Stickles collection until I started to make these cards, I used about 4 different colours of blue then a silver and white. Again, I love that little pointsetta stamp, it looks good in all the colours. I think I found it in a dollar store one day for less then a dollar. Supplies: Cream, silver and blue cardstock, Penny Black - Fantasy, Cornish Heritage Farms- Vintage Christmas, misc pointsetta stamp, blue velvet ribbon, Stickles, misc Midnight Stars embossing powder, silver embossing powder. There are only a small number of times during the year that I mass produce cards, Easter, Halloween and then Christmas and even then some detail of the card may change, ribbon, brads, gems something small. Not so much for the Christmas cards, this card is one of my favourites, so much so that I made it in three different colours. I used 6 different colours of stickles for all those dots. The pointsetta is embossed with Ranger Embossing Tinsel in red so that it sparkles like the Stickles. I love this little stamp, so much that I have used it on about 4 cards this year. I embossed the flower then cut it out and popped it up with foam. I love velvet ribbon, I wish I had it in every colour ever made, well maybe not that dramatic but I love it and I think it looks so pretty on this card. 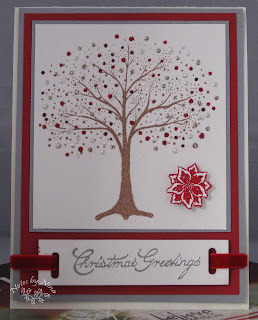 I finished this card by embossing Christmas Greetings in silver embossing powder. Supplies: Cream, silver and red cardstock, Penny Black - Fantasy, Cornish Heritage Farms- Vintage Christmas, misc pointsetta stamp, red velvet ribbon, Stickles, Ranger Embossing Tinsel, silver embossing powder. 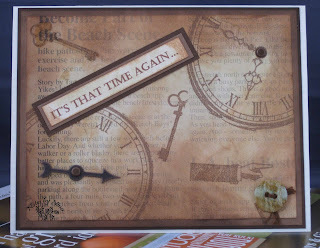 Supplies (Brown Card): Cream and brown cardstock, Designer paper – Creative Imaginations Daily Press, Stamps - Recollections – About Time and Kelly Panacci Time Flies, Tim Holtz - Idea-ology - Game Spinners, misc button and embossing floss. 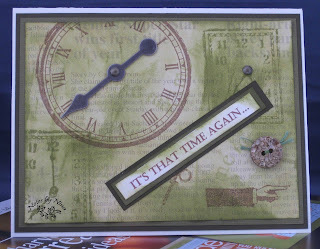 Supplies (Green Card): Cream and Green cardstock, Designer paper – Creative Imaginations Daily Press, Stamps - Recollections – About Time and Kelly Panacci Time Flies, Tim Holtz - Idea-ology - Game Spinners, misc button. brads and embossing floss. I hope you both have a wonderful Birthday. I love this card and it was so fun to make. I brought this stamp last year and have looked at it so many times but a card just did not call to me. 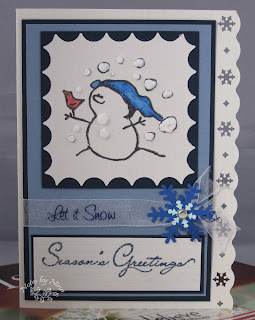 Paired with Kaisercraft Winter wonderland - Let it snow paper I had a surge of craftiness. 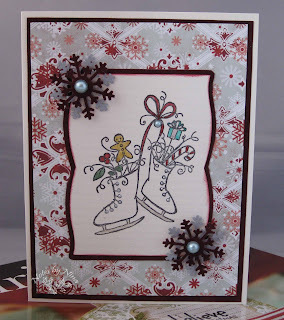 I started with using my Spellbinder Nestabilites Labels seven and stamped the Figure skates (Sunshine Designs). I coloured the skates with a white opaque pen from Inkssentials. Then used my Spica glitter markers for the treats and clear glitter marker for the skate blades. The burgundy back ground and layer are made with this beautiful suede paper from Paperwishes, it is like velvet on paper. 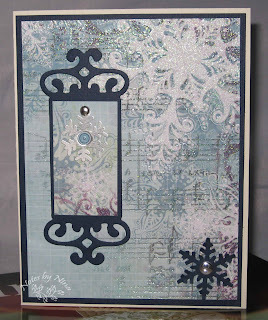 I used this same paper to punch out the snowflake, the silver snowflake is punched out of silver metallic paper. I finished the details with light turquoise pearls from the Recollections Autumn package. I have a number of friends who have baby's that will celebrate their first Christmas this year, so these cards have Baby's First Christmas stamped inside. Supplies: Cream cardstock, Designer paper burgundy suede - Hot off the press and Kaisercraft - Winter Wonderland, Sunshine Design figure skates, Martha Stewart - Snowflake Punch, Recollections - Pearls. A quick masculine thank you card. I added some slight glitter marker to parts of the sepia stamped image. This card was a nice departure from the Christmas cards I have been focused on. Supplies: Cream and light brown cardstock, Designer Paper - Hot off the Press, Close to my heart - Beautiful Things and Thank you, Dress it up - Tiny Wilderness, misc rickrack ribbon.